Many people have the misconception that mindfulness and meditation are things you are good at or not good at. The truth is that anyone can meditate. There really are no rules. It’s merely observing the simplicity of the breath and the complexity of the mind, without judgment. And it’s noticing the thought bubbles that appear naturally in the chattering mind versus allowing your mind to drift along with that thought. It’s watching where the thought goes, without creating a story or having emotions about that thought. It’s almost as if you’re watching your own brain from a distance. Deep right? People get frustrated when they attempt to do this and get carried away by thought wave after thought wave, realizing only when the session is almost over that they were supposed to notice their breath, and quickly scramble to do so. I’ve been there. I know that frustration. But, when you continue to practice, something magical happens over time. You can slow down, and you can observe. From that place, you can calm your nervous system, alleviate stress, still your amygdala, which is the part of your brain that signals your fight or flight response, and stimulate your prefrontal cortex which is our ever important area of the brain for executive functioning. I use these techniques in my Eating Psychology practice because I see how they help people become more mindful eaters and prevent binge eating. By improving executive functioning, you can create a barrier between a stimulus = trigger food and an immediate response = binging uncontrollably on said trigger food. The good news is that while a consistent meditation or mindfulness practice is best to achieve this, you can also have success with what I call Micro-Mindful Moments. Micro-Mindful Moments are those where you basically “stop, look and listen” in any situation, observe the body and senses, and tune in instead of responding to external stimuli. Here is an example: my kids are all over me; I’m trying to cook dinner, and I’m multitasking. I start to crave carbs and look furtively at the graham crackers on the counter. My “instinct” is to grab whatever is in front of me, react mindlessly to the chaotic situation, and deal with the consequences later. That default strategy has never worked for me, yet I would do it over and over again always expecting a different result! Now, when something stressful like this happens, I stop. I take 2-3 deep breaths. I observe by checking in with myself and start to embody vs. dissociate or numb out as a way to deal with stress. And then I listen…. what is my body telling me? Am I hungry right now? Or am I responding to stress? I see if there is anything thing else I can do to alleviate this stress other than attempt to numb it by consuming unhealthy food, which ultimately will cause me more stress! Most of the time I can turn on some music, take a quick walk, call a friend or just lay down for a minute. Sometimes I still give in to the treat and that is ok too. If I do that, I own the decision, I sit down with the treat and savor every freaking bite. 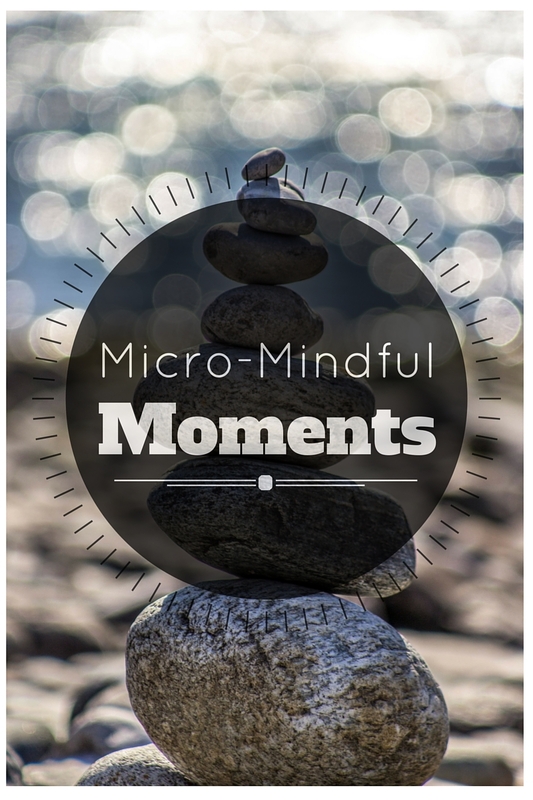 You too can have Micro-Mindful Moments. It’s just a matter of tuning inward – to become exquisitely present in the times you are least likely to want to feel your feelings. It will be strange and counter-intuitive at first. It will feel slightly surreal. But you will start to notice changes, and you will start to feel calmer and more empowered around your food choices, and with life in general. Mindfulness = it’s not just for monks in Bhutan anymore. Give it a try and tell me in the comments below how this strategy worked for you!